Goodness Gracious! A Great Ball of Stars! This is what half a million stars look like when packed into one big ball. 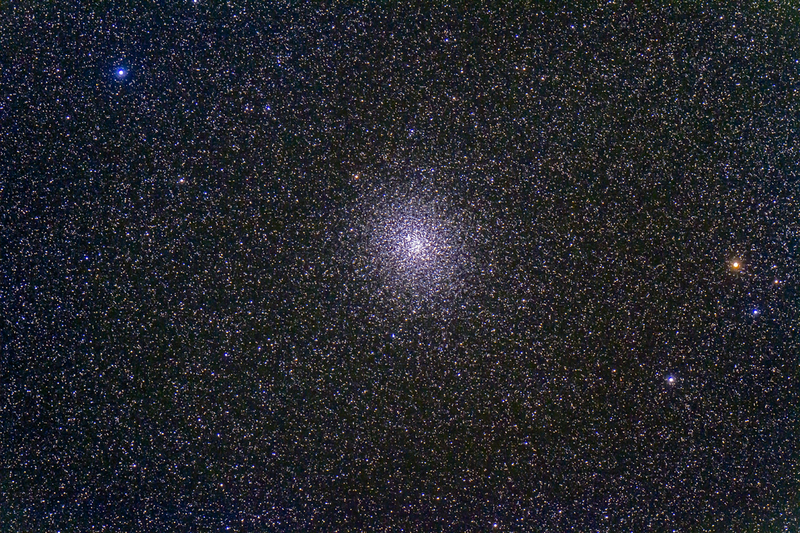 This is the globular star cluster called Messier 22, in Sagittarius. It’s the biggest and best such object visible from Canadian latitudes, though it always sits low in our summer sky. M22 is one of 150 or so such spherical clusters of stars that orbit our Milky Way. This one sits 10,000 light years away from us, toward the centre of the Galaxy. Those half million stars are packed into a sphere 100 light years across. In our sky it appears as big as the Full Moon, though not as bright of course. But just imagine the sky if you can view it from the centre of M22. The heavens would be ablaze with stars. I shot this with the 130mm refractor at f/6. 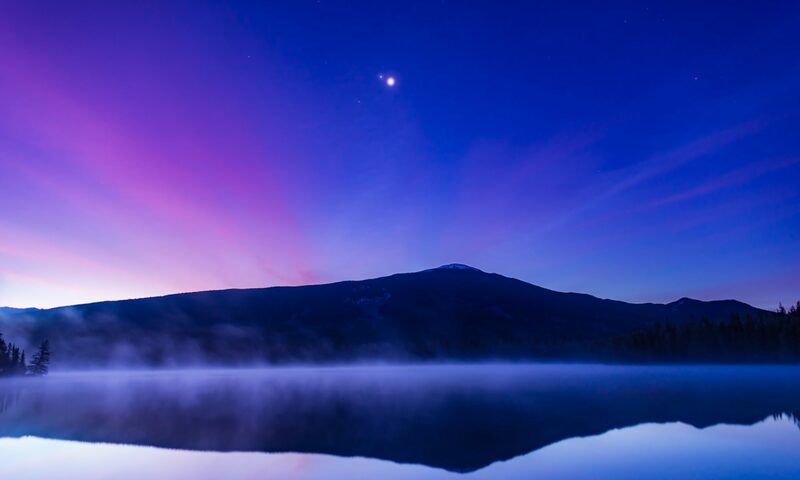 It’s a stack of just three 4-minute exposures with the Canon 7D. Though M22 was low above the southern horizon from the Cypress Hills where I shot this, the final image turned out pretty well. 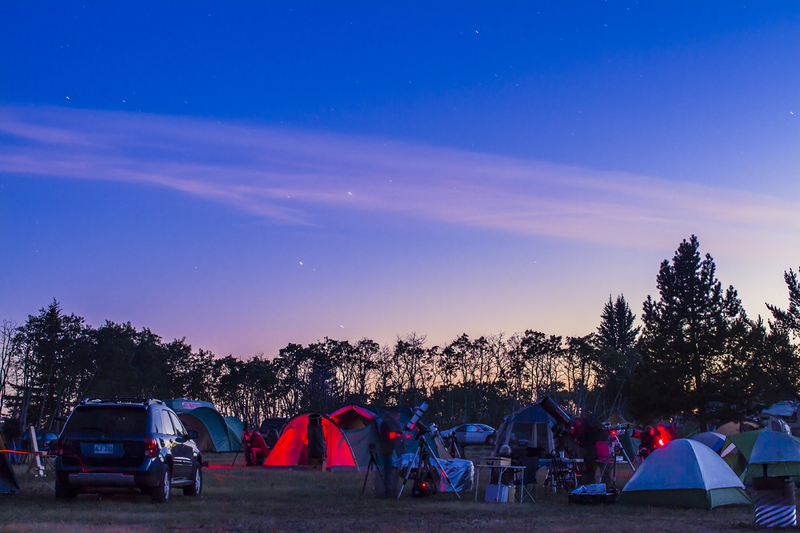 Here’s a final scene from the recent big star party, of campers under Mars and Saturn, two planets setting into the twilight. Saturn is just in the clouds, Mars is below, and just above the treetops is Spica, the brightest star in Virgo. The three objects were in close conjunction through mid-August but set early in the evening. 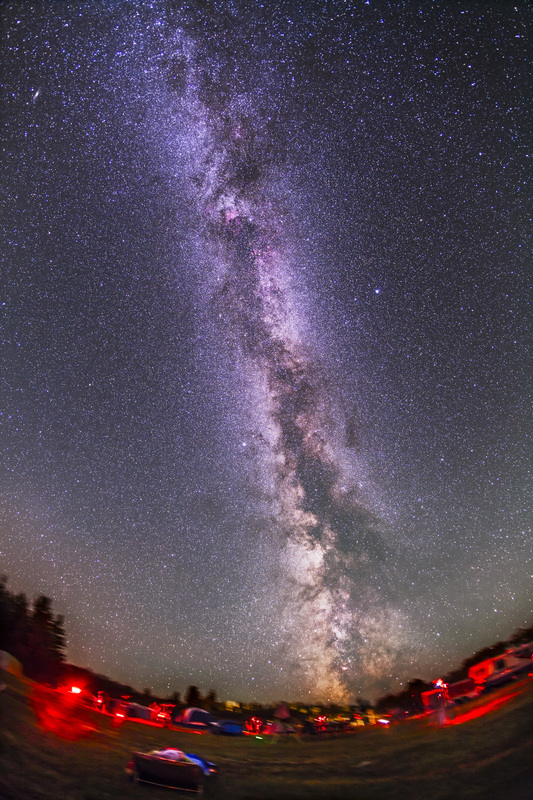 I shot this at the recent Saskatchewan Summer Star Party in Cypress Hills. Most of my blogs of the last 10 days have featured shots from the star party or of the star party. It was a super weekend for stargazing. This is the prime celestial real estate above us now on northern summer nights. This wide-angle shot takes in the Milky Way from Cygnus at right to Perseus at left, an area populated by lots of nebulas, both bright and dark. A couple of previous posts (The Subtle Shades of Cepheus and The Dark Clouds of Cygnus) featured close-up views of sections of this sky, the areas at centre in this wider context image in northern Cygnus and southern Cepheus. At bottom is the elliptical glow of the Andromeda Galaxy, another “milky way” beyond ours. I boosted the contrast and colour more than I normally do for astrophotos, to punch out the nebulas and the subtle dark lanes of dust that permeate this part of the Milky Way. I shot this last weekend from the star party in Cypress Hills, Saskatchewan. With three clear nights it was a productive weekend! The view doesn’t get any wider than this. 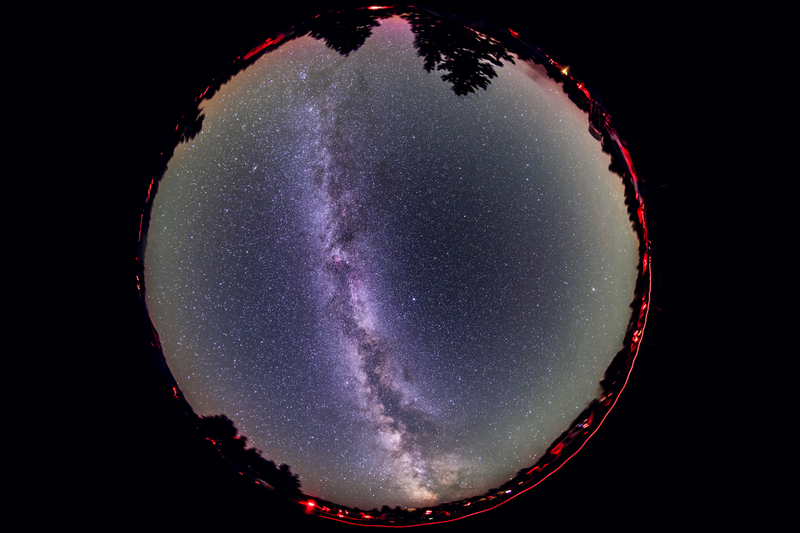 This fish-eye image takes in the entire night sky and summer Milky Way. 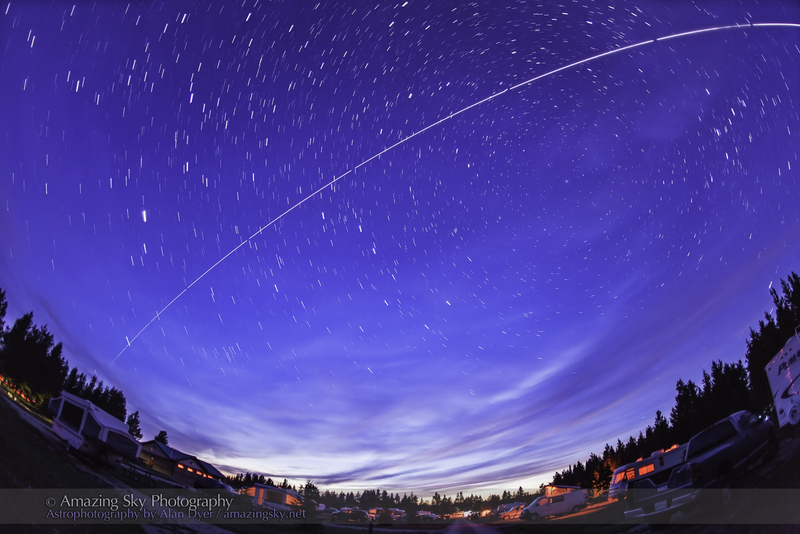 I shot this last weekend at the Saskatchewan Summer Star Party in Cypress Hills. Red lights of observers streak along the horizon around the perimeter of the circular image. At centre is the zenith, the point in the sky straight overhead. The sky was very dark, but the sky close to the horizon is tinted with the faint glows of aurora and airglow. 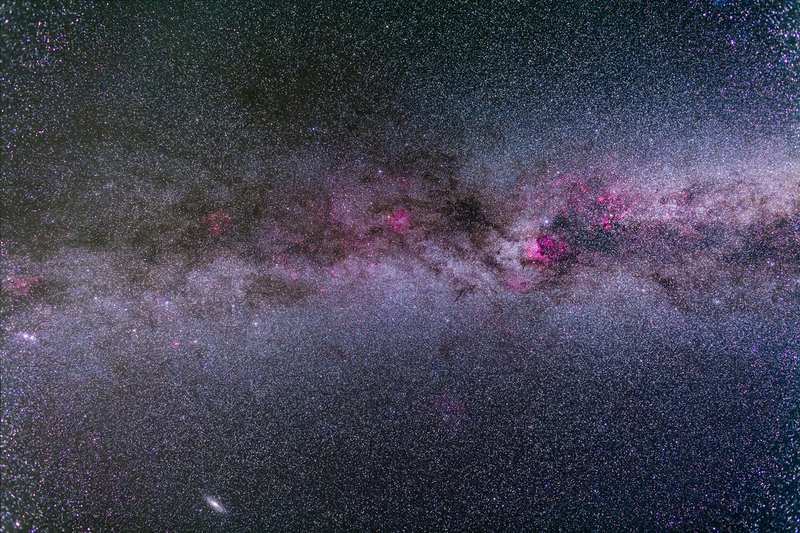 The Milky Way is the main feature of the summer sky, here stretching from Sagittarius in the south at bottom to Perseus at top in the north. Wide shots like this really put the giant lanes of dust into proper context; you can see their full structure and faint tendrils extending well off the Milky Way band. For these fish-eye shots (suitable for projection in a planetarium) I used a Sigma 8mm fish-eye lens and a full-frame Canon 5D MkII camera. This is a stack of five 5-minute exposures, all tracked. The landscape is from just one of the images, to minimize blurring of the ground. Just lie back and lose yourself in the Milky Way. That’s what one person is doing here, under the starry skies of Cypress Hills, Saskatchewan. In summertime the Milky Way is the main attraction at night. Here, it rises from the south, a region containing the centre of our Galaxy in Sagittarius, to climb up overhead through the star clouds of Scutum and Aquila, then into Cygnus in our local spiral arm, and on into Cassiopeia at the top of the frame in the north. As in most deep sky photos, I’ve boosted the contrast and colour to make a dramatic image. To the eye the Milky Way appears in subtle shades of grey painted with the dark brushstrokes of dust lanes winding through the bright clouds of stars. But your eye does see much of this structure. I like these types of ultra-wide images. They capture the mind’s eye impression of what the Milky Way looks like across the vault of heaven. This is a stack of four 5-minute exposures, all tracked on a small equatorial mount, the Kenko SkyMemo, and all taken with the Canon 5D MkII at ISO 800 and Canon’s ultra-wide 15mm lens at f/4, as you can see from the photo data at left. I retained the ground from just one image, to minimize the blurring from the slowly moving camera tracking the stars. I masked out the ground in the other 3 images. They help smooth out noise in the sky.